The Department for Transport (DfT) said the review will look at whether a new offence equivalent to causing death by careless or dangerous driving should be introduced for cyclists, as well as wider improvements for cycling road safety issues. Transport minister Jesse Norman said: ‘It’s great that cycling has become so popular in recent years but we need to make sure that our road safety rules keep pace with this change. ‘We already have strict laws that ensure that drivers who put people’s lives at risk are punished but, given recent cases, it is only right for us to look at whether dangerous cyclists should face the same consequences. The DfT acknowledged that while in 2015, two pedestrians were killed and 96 seriously injured after being hit by a bicycle, ‘every year more than 100 cyclists are killed and more than 3,000 seriously injured on British roads’. Cycling UK chief executive Paul Tuohy said: 'The consultation on road safety issues is an opportunity to keep cyclists and pedestrians safer. 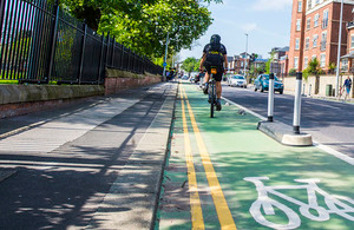 Cycling UK looks forward to working with the Department for Transport on this consultation to ensure it focuses on evidenced ways that keep our most vulnerable road users safe, by addressing risks such as dangerous roads, drivers and vehicles. The DfT said the review will seek to improve all elements of cycle safety and will be in 2 phases. The first phase will analyse the case for creating a new offence equivalent to causing death or serious injury by careless or dangerous driving to help protect both cyclists and pedestrians. The DfT said: ‘This will address a specific issue emerging from some of the most distressing cases seen recently and will be informed by independent legal advice.’ The conclusions from this phase are expected to be reported in the New Year. The second phase will be a wider consultation on road safety issues relating to cycling. It will involve a range of road safety and cycling organisations, as well as the general public and will consider different ways in which safety can be further improved between cyclists, pedestrians and motorists. It will consider the rules of the road, public awareness, key safety risks and the guidance and signage for all road users.